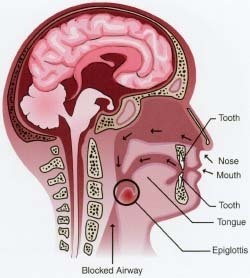 Epiglottitis - how long, body, viral, contagious, What Is Epiglottitis? Epiglottitis (eh-pih-glah-TIE-tis) is a condition involving life-threatening swelling of the epiglottis. It is usually caused by a bacterial infection of the epiglottis and can result in a blockage of the trachea (windpipe) and severe breathing difficulty. Epiglottitis, also known as supraglottitis (su-pra-glah-TIE-tis), is characterized by inflammation and swelling of the epiglottis and other upper airway structures. The epiglottis can become dangerously swollen within just a few hours, leading to narrowing of the airway and severe breathing difficulty. Epiglottitis is usually caused by bacterial infection. Haemophilus influenzae type B (Hib) bacteria accounted for the majority of epiglottitis cases before the widespread use of the Hib vaccine. Staphylococcus aureus Streptococcus pneumoniae and group A, B, and C streptococci bacteria; certain viruses; traumatic injuries; scalding; and severe smoke inhalation (causing burns in the upper airway) can also lead to epiglottitis. Epiglottitis is most common in children under 7 years of age. In the United States, cases of epiglottitis have declined greatly since the Hib vaccine was introduced in 1985. * epiglottis (eh-pih-GLAH-tis) is a soft flap of tissue that covers the opening of the trachea (windpipe) when a person swallows to prevent food or fluid from entering the airway and lungs. Bacterial infection may cause inflammation and swelling of the epiglottis, which can quickly bring about narrowing or even closing of the airway and severe breathing problems. person-to-person contact, often in drops of moisture from the respiratory tract when someone sneezes, coughs, or breathes. What Are the Signs and Symptoms of Epiglottitis? Because their airways are smaller than those of adults, children with epiglottitis are at higher risk for developing severe breathing problems. How Do Doctors Diagnose and Treat Epiglottitis? Normal airways allow the free flow of air through the nose and mouth past the epiglottis, and then into the lungs. performed, in which a tube is inserted into the windpipe through the mouth or nose to ensure that air can continue to flow into the lungs. In some cases, an emergency tracheostomy * must be performed to bypass the blocked part of the person's airway. Doctors usually diagnose epiglottitis based on a physical examination and the patient's medical history. If the diagnosis is not clear, a doctor may order an X ray of the neck that will show if the epiglottis is swollen. Blood cultures or other blood tests may be used to confirm that the person has a bacterial or viral infection. Intravenous * (IV) antibiotics are usually given to combat the infection that led to epiglottitis. Corticosteroid * medication is sometimes given to further reduce the swelling of the upper airway so the person can breathe more easily. People with epiglottitis are hospitalized, usually in intensive care, for several days to a week or more to manage the infection that led to epiglottitis. The time it takes to fully recover varies depending on the particular infection. * tracheostomy (tray-kee-AHS-tuh-me) refers to a small opening through the neck into the trachea, or windpipe, which has been made to allow air to enter the lungs more directly. The surgical procedure to create a tracheostomy is usually performed when a person's upper airway is narrowed or blocked or when there are other problems causing breathing difficulty. * intravenous (in-tra-VEE-nus) (IV) means within or through a vein. For example, medications, fluid, or other substances can be given through a needle or soft tube inserted through the skin's surface directly into a vein. 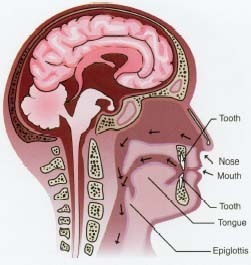 Possible complications of epiglottitis include pneumonia * , ear infection and, rarely, meningitis * or bacteremia * caused by the same microorganism that caused the epiglottitis. If not treated quickly, epiglottitis can result in complete airway obstruction (air can no longer flow into the lungs) and death. The best way to prevent epiglottitis is to avoid infection by the bacteria that most commonly cause it. The Hib vaccine, which is part of the routine childhood immunization schedule in the United States, has been extremely successful in decreasing the number of cases of epiglottitis resulting from H. influenzae infection. The Hib vaccine is given as four separate injections (shots) before 2 years of age. * corticosterolds (kor-tih-ko-STIR-oyds) are chemical substances made by the adrenal glands that have several functions in the body, including maintaining blood pressure during stress and controlling inflammation. They can also be given to people as medication to treat certain illnesses. * meningitis (meh-nin-JY-tis) is an inflammation of the meninges, the membranes that surround the brain and the spinal cord, Meningitis is most often caused by infection with a virus or a bacterium. * bacteremia (bak-tuh-REE-me-uh) is the presence of bacteria in the blood. The U.S. National Library of Medicine, 8600 Rockville Pike, Bethesda, MD 20894. A search of the National Library of Medicine website provides information about epiglottitis and the Hib vaccine. KidsHealth.org . KidsHealth is a website created by the medical experts of the Nemours Foundation and is devoted to issues of children's health. It contains articles on a variety of health topics, including Hib immunization information.